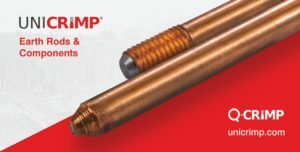 Unicrimp’s latest product development activity sees the company enter a brand new product category with the launch of a range of earthing rods and component products. Earth Rods, or Earth Electrodes, are conductive metal poles buried directly into the ground and connected to the Earth circuit of an electrical installation. If there is a fault, they provide a low resistance path that allows electricity to safely dissipate out into the ground. There is a growing need for improved reliable earthing as current infrastructure is ageing and deteriorating and the increased use of plastics within incoming services is reducing earthing possibilities. The new Unicrimp Earthing Product range comprises just 10 individual products which together forms an earthing system. At the heart of the system is the Threaded Earth Rod, made with a low carbon, high tensile steel core and molecular bonded 99.9% pure copper coating for maximum conductivity, strength and durability. Where required, multiple Earth Rods can be joined together using threaded couplers and the threaded driving stud attaches to the top of the Earth Rod to protect against damage when driving the Earth Rod into the ground. A selection of clamps and two inspection pits make up the range.